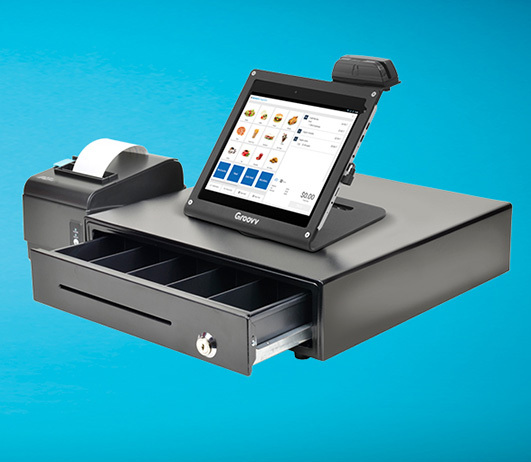 Manage and grow your business with the Groovv tablet point of sale system. Now you can collect your customers information, such as email or mobile phone number and easily connect with your customers to send them special offers, or new product information - all with a few clicks. Professionally designed templates are included that you can customize to create the perfect message or offer to your clients. These offers or information can be instantly sent by email, text, facebook, twitter or posted on your web site. Easily connect your Groovv Register thru dial up or ethernet. Track inventory, Customer information, or sales activities with reporting tools included. You can also customize departments and inventory for easy access and viewing right on the Groovv Register. Perfect for Restaurants where tips and server tracking is required. A kitchen printer can also be supported for a more efficient restaurant operation.